The extent to which to you accept the Audi A4 allroad (allroad is lowercase at Audi’s insistence) as a crossover is a matter for conversation over beer. What matters here is the extent to which the A4 allroad can be considered a well-built, practical, and rewarding vehicle—and it is very much all of those things. With the Q3 and Q5 compact and midsize crossovers already in the lineup, Audi wouldn’t seem to need another small ute, but the German maker clearly sees need for something a little sportier and closer to the ground. The 2017 allroad rides on standard 18-inch “V-Spoke” alloy wheels. 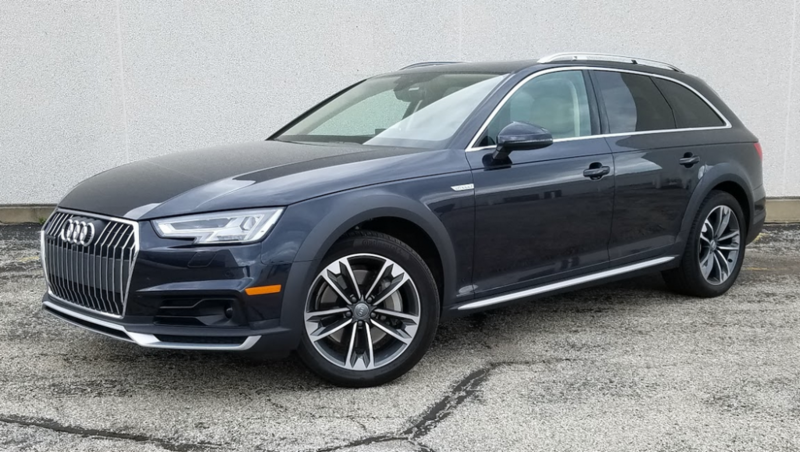 Compared to the A4 sedan lineup—which includes three models, three engines, and multiple trim levels—the allroad is limited to a single model with a single drivetrain, and just three trim levels. Offered for 2017, and repeated for 2018–new models are now rolling onto dealer lots–are Premium, Premium Plus, and Prestige trim levels. The 2018 entry-level Premium starts at $44,500 plus delivery. The Premium Plus comes in at $47,200 and adds full LED headlamps, front- and side- obstacle detection and rear cross-path alert, Bang & Olufsen audio, and hands-free tailgate release, among other features. At $53,000, the Prestige adds head-up instrumentation, adaptive cruise control, Audi’s Collision Avoidance Assist and Active Lane Assist systems, and a top-view camera system. True to the Audi norm, the allroad cabin is a classy enclave, though not especially roomy for larger folks. Second-row legroom is limited behind tall front-row occupants. 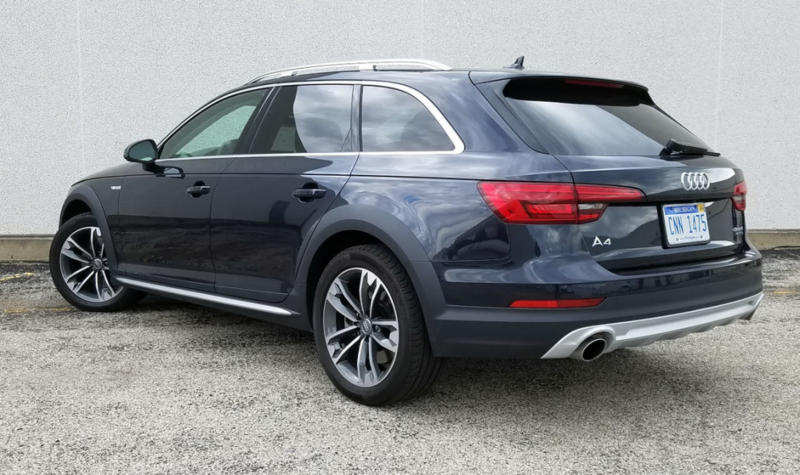 All allroads employ a 252-horsepower 2.0-liter turbocharged engine mated to a 7-speed dual-clutch automatic transmission and Audi’s quattro all-wheel-drive system. Compared to the A4 sedan, the allroad sits about an inch and a half higher off the ground and rides an inch-longer wheelbase (110 versus 111). Apart from some rocker-panel trim, the allroad isn’t as salted with off-road-looking elements as similarly themed vehicles (such as the Subaru Outback). As a wagon, the allroad does a nice job of providing stowage space. There’s 24 cubic feet of space behind the second-row seats, which expands to 59 cubic feet with the rear seat backs folded into the floor. With the second-row seat backs folded, the allroad offers almost 60 cubic feet of cargo space. 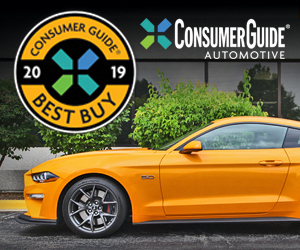 In driving that including a slight highway bias, the Consumer Guide® team averaged better than 26 mpg over 463 miles. That feels fairly frugal to us given this car’s power and performance, and is in line with the EPA combined 25-mpg estimate. The allroad isn’t cheap, but feels special enough to justify its price tag. The cabin is well finished, the drivetrain strong and smooth, and the ride and handling balance spot on for a sport wagon. The allroad may be the perfect non-crossover crossover for luxury-brand buyers looking to drive something just a little different than what everyone else has. 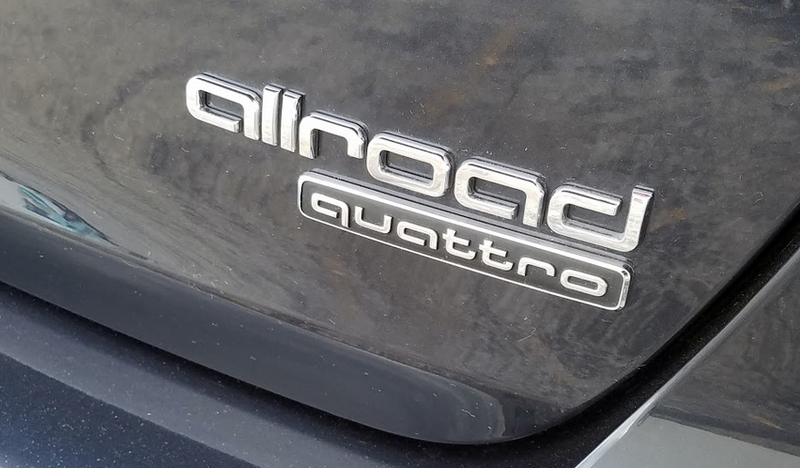 Per Audi style dictum, neither the a in allroad, nor the q in quattro is capitalized. The allroad wagon that has been added to the redone 2017 Audi A4 line is supposed to have a whiff of sport-utility vehicle about it. If so, the allroad does a pretty good job of hiding it. Sure, it comes with quattro all-wheel drive, but so do lots of other Audis that clearly aren’t SUVs. Ride height is raised slightly, but you’d have a hard time buying that behind the wheel in a seating position that feels kind of low. 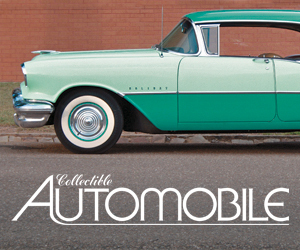 It’s pretty much up to the body configuration and some black-plastic fender flares to sell the idea. Under the hood and in the cabin the allroad is virtually indistinguishable from the A4 sedan that’s a Consumer Guide® premium-compact “Best Buy” choice—not at all a bad thing. (Well, there is that MMI central infotainment controller to contend with. . . .) In back, there’s pretty good rear cargo space that loads at bumper height onto a flat floor, and remote releases that make it easy to drop the 40/20/40-split rear seat backs for additional space when needed. On the road there’s perky acceleration from the turbocharged 2.0-liter 4-cylinder engine, and satisfying cornering and handling behavior. Gilded with a number of packages and individual options, CG’s test vehicle ran up to $55,575 delivered. If that sounds a little high for a compact wagon, just remind yourself that you’re getting an SUV thrown in to the bargain. Styling-wise, Audi only gently suggests that the allroad is a crossover alternative. Note the bright rocker-panel trim and subtly flared wheel arches as evidence of this small wagon’s trail-traversing character. Written by: The Daily Drive staff on July 14, 2017.on March 22, 2019.